We launched a new feature today: you can now reorder tracks in our notation/tab editor. 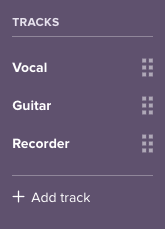 When viewing the track list in the editor pane, you’ll see little “draggy” icons next to each track. Just drag those up and down to reorder. Your notation and tablature will be reordered instantly. Easy!